You know you're watching a good short film when it leaves you hungry for more. And that's just what DO NO HARM, which premiered at SXSW Festival, left me feeling. That's not to say that it's incomplete (not at all). It's because it's just that compelling, thrilling, and unexpected. I went into the action thriller not knowing much about it except that its poster featured a woman in bloody scrubs with an intense look on her face, so I needed to know what that was about. Oh, and that the film is written and directed by an Asian-American woman (Roseanne Liang). It was already winning in my book. 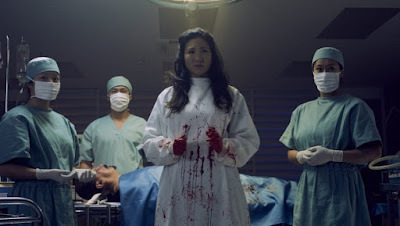 As it turns out, the 12-minute film is about a doctor whose emergency surgery gets hijacked by a band of criminals with an apparent vendetta against her patient. That is, until she intervenes with a cold can of whoopass. Soon we learn a little more about the danger surrounding her patient and the stakes she's up against—yielding, even despite its length, a deft portrait of survival, duty, and womanhood. Then there's IT BEGAN WITHOUT WARNING, a gut punch that, similar to Do No Harm, wastes no time getting right to the action—which in this case involves a group of kids up to no good, playing with indiscernible slimy alien things, and terrorizing adults. It's a brutal 5-minute nightmare that leaves you with more questions than it answers. 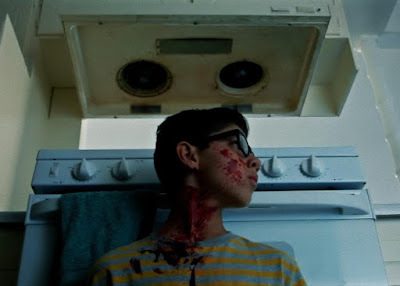 But it keeps you interested, in a Goodnight Mommy kind of way. It could use some fleshing out, but writing/directing duo Jessica Curtright and Santiago C. Tapia present an intriguing look at what you can do without any dialogue and just five minutes of screen time. That's worth talking about. In the realm of uninspired, literal horror like The Bye Bye Man comes THE TICKLE MONSTER, which is exactly what it sounds like. A giggling monster hiding in the shadows pops up out of nowhere and begins tickling his millenial victims. But you can't really see it, and can't stop it. Actually, you're not ever really certain whether you should truly be scared (or whether you should laugh) because, after all, it's just tickling people; not killing them or hurting them in any real way. Pretty hokey. For more information about this year's SXSW Festival, click here.